School is officially out for the summer! I'll miss the group of students that I had, but I am looking forward to a new group of fresh young minds. Since it is summer break, it's the perfect time to first relax, but to also plan for the upcoming school year. In retrospect I have learned a lot this past school term. I noticed some things that worked really well and some that just plain flopped. I observed this past year some of the students had not been introduced to a wide variety of different types of animals. So, for the upcoming year I plan on introducing a variety of animals throughout the school year. My wonderful assistant and I discussed the classroom theme, and we came up with a circus theme. I am currently working on bulletin boards, word walls, center signs, and classroom decorations and activities centered on the circus theme. Cubby Tickets – A set of (4) colorful tickets with editable text boxes in Microsoft Word. 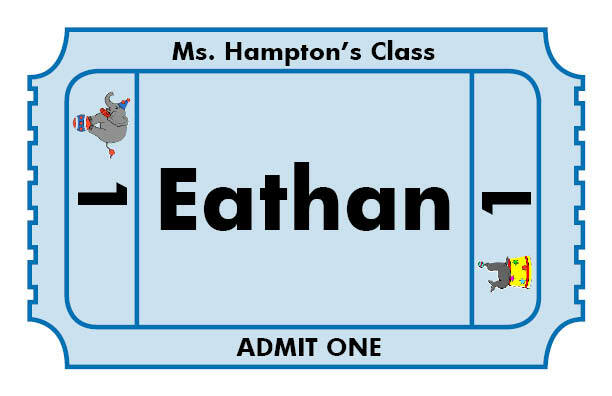 I plan on using the tickets to label the children’s cubbies this coming up school year. I will also take a picture of them on the first day of school and add to the ticket. This will help the children that cannot recognize their name in print. do you still have the circus tickets available? I have fixed the link. They are ready for download. Thank you!